A curious thing happened this last week. Angus Robertson’s new company, Progress Scotland (‘commissions public opinion polling … to better understand how people’s views are changing in Scotland’) published its first research. If you missed it, Progress Scotland ‘aims to help prepare the case for Scotland to progress towards independence, keeping pace with the views of the people who make their lives here’. A series of posts on their web site by their ‘Independent polling expert’ Mark Diffley has highlighted some of the main results of a survey carried out for them by Survation of over 2,000 members of that company’s panel of people living in Scotland. The article includes comment on survey results covering – the role views on the EU might play in any future independence referendum; the impact of Brexit on Scottish public opinion; voters who are undecided or open-minded about independence (sic – because they could equally be open-minded about the UK); and belief in whether independence will ever happen. The link above will take you to the articles. The curious thing is that the full results of the survey seem to have been published only briefly on the Survation web site before being taken down. They have yet to appear on the Progress Scotland site. As any good pollster will tell you, only access to the full results of a survey allow you to judge whether any comment or interpretation is both correct and honest. Data obtained by ex-SNP deputy leader Angus Robertson’s pro-independence polling outfit has shown low support for independence [my emphasis]. Robertson’s official write up failed to mention the findings, and the full tables were removed by Survation shortly after they were published. Assiduous Tweeter @SteveSayersOne has put out a series of tweets over the last few days looking at aspects of the data obtained by Red Robin. The rest of this article examines one issue arising from the survey in more depth. Notwithstanding all Progress Scotland’s finessing about the impact of EU and Brexit on people’s views about independence, the fundamental question on the subject is people’s propensity to support independence. As monitored by Professor John Curtice on his What Scotland Thinks web site, this is usually couched in terms of ‘How would you vote in a Scottish independence referendum if held now?’ It is a subject missing from Progress Scotland’s analysis of their own survey. The Red Robin web site shows that not only did Progress Scotland collect data on the subject they did it in a more detailed and sophisticated way than the basic ‘How would you vote’ question of most surveys. The fact that they interviewed over 2,000 people also means their results will be somewhat more accurate than the typical 1,000 interviewees of most polls on the subject. It’s impossible to know what went through people’s minds if they gave the question a score of, say, 3 or 7. But we can be pretty sure that at the extremes of the range anyone scoring 0 or 10 is pretty damn well fixed in their opinions (‘A recalcitrant nat/yoon’ as their opponents might say). We can also speculate that those at the mid-point of the range of possible answers, 5, might be most amenable to changing their opinion in either direction. This is where the detail of the graph gets interesting. First, note that 40% of people in the survey completely support Scotland staying part of the UK, compared with only 24% completely supporting independence, a much bigger gap than the 55:45 found time and again in other surveys. 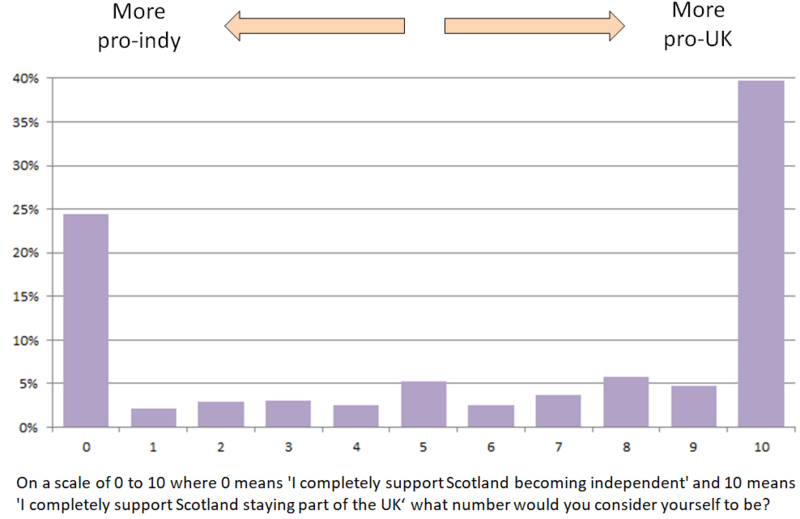 Second, at each point as you move away from what I describe as the mid-point of the range, there are more people inclined to support staying in the UK than to support independence, for example, towards the two extremes, 5% at point 9 compared with 2% at point 1. Third, the net result is that 58% of people lie on the UK side of that mid-point, compared with 35% on the independence side. Another way of looking at the data is that since 64% completely support either staying in the UK or independence, only the remaining 36% are amenable to change, and some of them (for example, the 1s and 9s, maybe even the 2s and 8s) are also not likely to change. So if there were to be another independence referendum (not in the light of these figures very likely, at least in the short term), any pro-independence campaign would have a heck of a lot more persuasion to do of the 36% than a pro-UK campaign. You might want to dip into the detailed tables to see what impact views on the EU and Brexit might have on public opinion. But bear in mind that the pro-indy/pro-UK figures here come despite 62% of Scots voting to remain in the EU referendum and despite three years of arguable muddle, incompetence and most recently crisis in negotiating the UK’s exit from the European Union, what one SNP MP rather unhappily described as a ‘cluster bourach’. You might now understand why you have to search for the full results of Progress Scotland’s survey and why they did not want them to appear in public. Their obfuscation does not bode well for any reputation they might hope to build. But while there is never any reason for complacency on the pro-UK side of the argument, the survey also does not bode well for those advocating another early referendum on separation. Note. The figures from the survey quoted above have been rounded to the nearest whole percentage point. The graph has been prepared from the more detailed numbers in Table 1 of the full survey results and so may vary marginally from figures in the text. As the never-ending agitation to unravel the result of the ‘once in a generation’ referendum of 2014 continues, I’ve taken to recording each year’s most-read posts on the ‘No Thanks!’ blog. 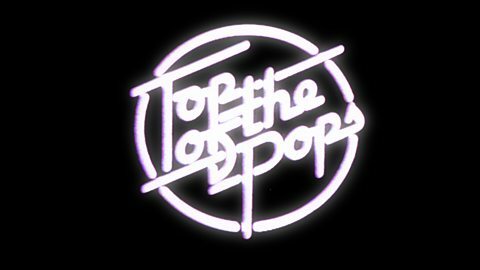 Here are the top ten most-read of 2018, in traditional Top Of The Pops ascending order, with some added comments. Not all were posted in 2018 which, if nothing else, shows that interest in some subjects is more than ephemeral. I’m surprised this is the only mention of Catalonia in my 2018 Top Ten, as it’s a subject I’ve returned to a number of times. This piece was a detailed examination of the abuse of the English language (and much else) by nationalist George Kerevan in an article he had in ‘The National’ newspaper. It contained much nonsense, not least the bizarre claim that the properly-conducted arrest of a limited number of ex-Catalan politicians who conducted an illegal ‘referendum’ ‘is a coup [sic] that affects Scotland directly’. Hogwash George, hogwash. No. 8 Mass conversions to Scottish independence? A few examples of nationalist ‘food activists’, people who object to how food is labelled. The affliction comes in various forms but essentially if a package doesn’t say ‘Produce of Bonny Scotland’ in large letters and sport a saltire for the functionally-illiterate, they dinnae like it. No-one seemed to pick up on the perhaps slightly unkind allusion in the title of the article. Perhaps they never will. 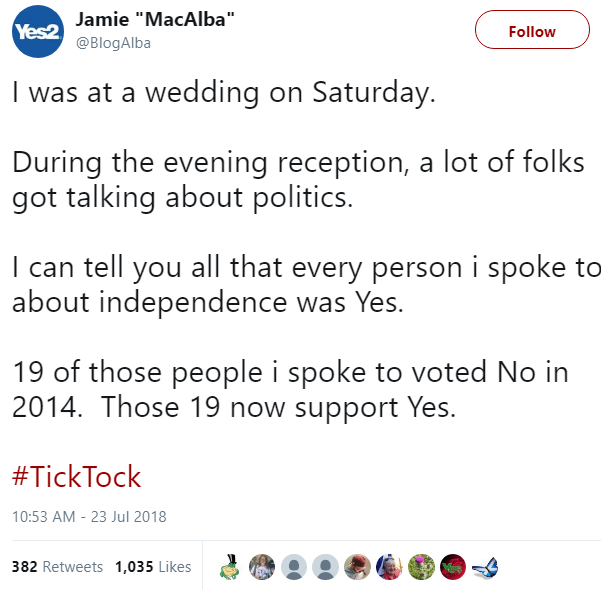 The first ‘mass conversion to Yes’ story I noticed, back in 2017, given a new lease of life by No. 8 above. Its perpetrator went all shy and blocked me on Twitter when I asked for some proof of his claim. No. 5 YesM8? NoM8 – don’t touch it with a barge pole! I don’t know if there’s any overlap between the food activists recorded in No. 7 above and the ‘bridgivists’ who drape bridges over main roads with tatty nationalist flags and slogans but they’re certainly from the same dark, demented corner of nationalism. This article was about a group who claimed to have a supportive e-mail from Police Scotland about their activities. I doubted the document’s veracity. I was being cautious. I’ll lay money on it being a forgery. Again, blocked on Twitter for my troubles. Posted a year ago today, this recorded attempts by online nationalists to ‘out’ a number of anonymous pro-GB accounts on social media. I’d say their efforts were sub-Clouseau at best, although Agatha Christie would never have had Clouseau say as one contributor to the discussion did, ‘The sooner they all f*** off to Englandshire the better’. Charming. A seafood processing plant closed in South West Scotland during the year. Guess what? It was all part of a plot by Westminster to manage the decline of Scotland’s economy. It has to be true because hundreds of people liked tweets that said so. A curious coincidence from a long-ago job I had allowed me to show the claim was, to be polite, hokum. If you don’t like what a book says, try to get it withdrawn from sale. Not the view of some solitary extremist, but of an official SNP branch, and the attempt at censorship worked. Not good. Finally, at No. 1 is the most-read post on the ‘No Thanks!’ blog this year. No. 1 Are the Scottish government’s baby boxes safe? Much that was infelicitous surrounded the development and launch of the SNP government’s baby boxes. After several Freedom of Information requests I got as much as I thought I would from the government on the subject. This was the result. A follow-up, Scottish government baby boxes – more information, more concerns, after a new minister sanctioned the release of more information on the subject, did not make this year’s Top Ten posts. You’d have to read both posts to reach your own conclusion but I still have my doubts about a number of aspects of the scheme, and not only the safety of the boxes. Previous comment was treated as tantamount to a confession that I wished the new-born harm, so I await with interest to see if this reminder of the subject elicits the same response. A Happy New Year to all my readers, of whatever political stripe. 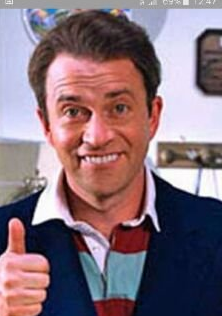 You probably have to be at least in your thirties to remember Harry Enfield’s TV character Tim Nice-But-Dim. If you add the description ‘upper class twit’ you probably have all you need to know about Tim, a desperately decent naïf moving through the world in a fog of bemusement and constantly outwitted by the baser creatures surrounding him. We need you here, Nicola! Please can we have SNP candidates standing in England? Can’t wait to move up! If I can be allowed a generalisation, the authors of these encomiums seem to be disproportionately female, to come disproportionately from London and invariably see themselves as liberal or progressive. Aye, come on up, you’ll have a warm Scottish welcome! I assume the innocents who’ve been love-bombed like this are unaware that there’s nothing some Scottish nationalists like more than a tame Brit (which is what they’d probably be called in private) they can parade like a mascot. If you’re one of those decent English people who’ve reached this far, my tone has probably put you off. I apologise. I don’t mean to be rude but you really are playing into the hands, not of Scots generally, but of some Scottish nationalists specifically. If you persist in exchanges with those people you will be told about how wonderful Scotland is – our scenery (true, though no modern political tendency can claim credit for the hills and glens), our services that are so much better than England’s, how we all hate Trident, how our government struggles to mitigate the evils of the Tory Westminster government (but don’t worry, if it was a Labour government there’d still be evils to mitigate, just different ones), how, probably like you, we all want to stay in the EU, and how peaceful, progressive and hospitable we are. that, contrary to the impression cultivated by our nationalists, most of us have never wanted to separate from the rest of Britain. If you’re not careful, you may find yourself in the middle of a full-blown row between the opposing camps we have been divided into since our referendum in 2014. I apologise on behalf of those amongst us who are pro-British if we get a little carried away in how we express ourselves. You may see our opponents characterising us as ‘talking down Scotland’, something we are confronted with on an almost daily basis if we have the temerity to criticise our SNP government or Scottish nationalism. Finally, you may conclude, as I saw one innocent Englishwoman concede online the other day, that ‘I hadn’t realised it was so complicated’. It is, so with the greatest respect, don’t be a Tim Nice-But-Dim. But thanks for reading anyhow. Mhairi Hunter, if you don’t know, is a Glasgow councillor, SNP convenor of that council’s health and social care committee and previous election agent for Nicola Sturgeon. In the subsequent discussion of her tweet she made three things clear. First, her view did not apply across all parties, she was ‘friends with Labour people’. Second, that she could not be friends with a Tory because of the UK government’s social security policies, in particular the impact on people’s lives of benefits’ sanctions. And third, she did not mean just anyone who voted Tory, but a member of the Conservative party. 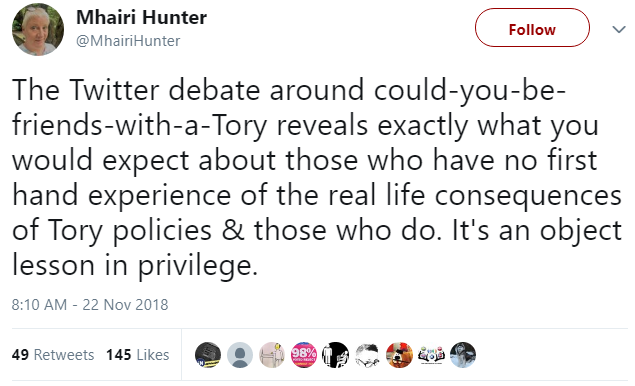 A cynic might detect just a tad of seeking electoral advantage in Ms Hunter’s public assertions on the subject; not only as an elected politician in a traditionally socialist and anti-Tory city but also in her exclusion of Tory voters (even lifelong Tory voters?) from her embargo on friendship. They are, after all, potential voters for other parties including hers. 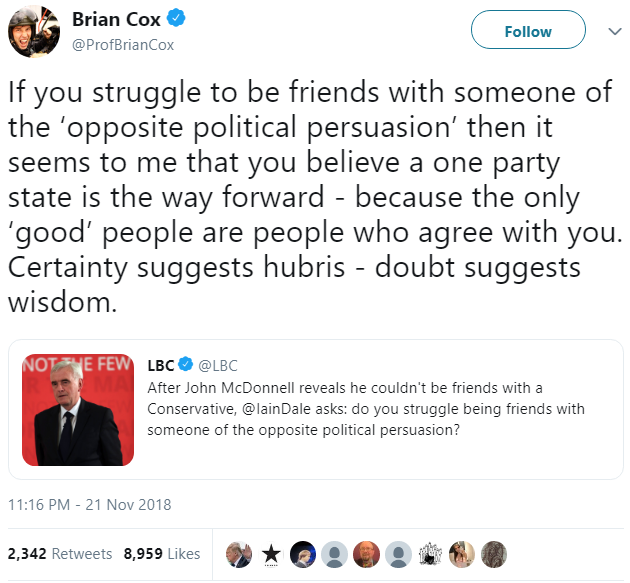 Well, she must do what she has to and clearly she is not alone: you’ll see the origin of Cox’s tweet in a statement made by Labour’s John McDonnell and I’ve no doubt there are some members of all political parties who feel the same. Still, I find the attitude rather sad and self-defeating. It represents the demonisation of a whole group of her fellow citizens for, in her case, apparently one reason alone. It elevates politics and political viewpoints above all else and says that members of a particular party cannot be good people. It’s especially blinkered in the context of being a local councillor. Her political role is at two removes from the MPs who determine UK-wide social security policy. Political parties are at best groups who coalesce around broad ideas. You don’t have to look far to find differences of opinion and dissent – Conservative leavers vs remainers; Corbynistas vs Blairites; the expelling of the 79 Group from her own party. Local issues are, or should be, less divisive and local councillors are not responsible for what happens at Westminster. Interestingly, the discussion engendered by Mhairi led to some contrary views on Twitter. 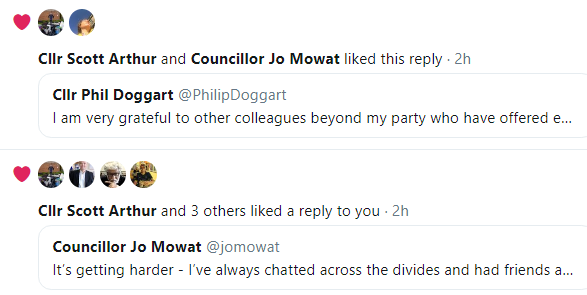 It may be significant that these three councillors are all from Edinburgh. As a long time toiler (ex- now) in the groves of local government I know that councils often have their own ingrained cultures. I worked for one where, over the course of ten years or so, all four major political parties were part of administrations that ran the council, either alone or in coalition. If you wanted to see a robust, even bitter, debate in the council chamber, the Labour and Conservative group leaders were the ones to watch. ‘Hammer and tongs’ doesn’t even begin to describe the way they went at it. Yet outside that arena it was ‘John’ and ‘Bob’ and their wives were the best of friends. It didn’t make either of them a traitor to their class or party. Should you dismiss all this as just parish pump politics, I cite the friendship between Alex Salmond and his ‘pal’, Tory Brexiteer David Davis, and I’ve no doubt there are many other examples. 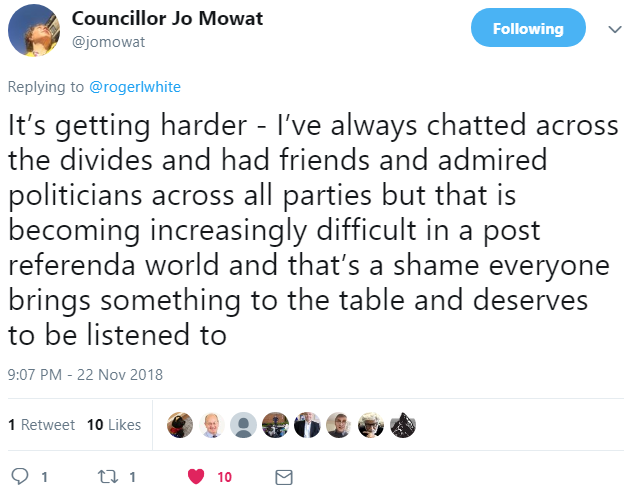 As I said, I find Mhairi Hunter’s view on the subject not only sad, but also self-defeating – not least because in a democracy politicians of different parties have to work with each other as well as in opposition. Once politics was about only a few things. Today, it is about nearly everything. Some seem to need it that way but it’s not necessary. One of the enduring myths of Scottish nationalism is the people who voted No in 2014 (i.e. they wished to remain as part of the UK) who undergo a sudden conversion to ‘Yes’ (they now wish to leave). Attempts to check the veracity of what looked like an unbelievable occurrence ended in my being blocked by Mr Aitken, which I notice I still am. You’ll see in my previous post that he advertised himself as an ‘MSP staffer’, i.e. he worked for an SNP MSP. A quick glance at his Twitter account shows that he’s dropped that statement but his recent tweets are still all about nationalist politics. As with Mr Aitken there were curious and frankly unbelievable elements to this story. Who spends significant time at a wedding discussing politics, let alone with multiple people? And not only was everyone he spoke to for Yes (minus the Tory councillor?! ), but a sub-set of nineteen had moved from No to Yes. Guessing at a modest 5 minutes per conversation to establish the ‘facts’, Jamie must have spent over an hour and a half talking about nothing else even with the nineteen. I’ve heard of wedding bores but that’s ridiculous. He rounds off his wee work of fiction with the tedious hashtag ‘#TickTock’, the fatal blow to the veracity of his claims. Of course, it was a bit cheeky to ask for names. Perhaps unsurprisingly I’ve not had even a general reply, although I see she’s been discussing her tweet with other less sceptical readers. Does any of this matter? Well, look at the numbers who’ve liked the various stories when I clipped the tweets concerned – 353 for Mr Aitken (it reached 456 eventually), 1,035 for Jamie, and a whopping 1,200 for Ms Cook. Each has also had hundreds of retweets. These myths won’t convert anyone from No/Remain to Yes/Leave but they provide comfort to the gullible. I’ve no doubt there are other mass conversion stories out there. I’ll add them to this post if and when I discover them. Footnote: if you’re wondering why I’ve twice used remain/leave as well as no/yes in this post, it’s a reference to the recent interesting experiment carried out by Survation for Scotland in Union of substituting remain/leave for no/yes in a properly conducted opinion poll. Miraculous conversions from No to Yes/Remain to Leave are everywhere it seems. They never come with hard facts but the faithful clearly believe them. I’ll add other examples as they come to my attention. Meantime, those pesky polls scarcely change. But never let the facts get in the way of a good story. Here’s one that only involves one individual but it shows what a humble dose of caffeine in the right hands can achieve. If ‘Susan’ owns or manages the organisation that has produced this detailed result her impertinence is remarkable – interrogating all 22 of her staff about their past voting behaviour and future intentions, all presumably within a short period of time. If she is a mere colleague, someone needs to tell her to knuckle down to work instead of spending all the day gossiping about politics. 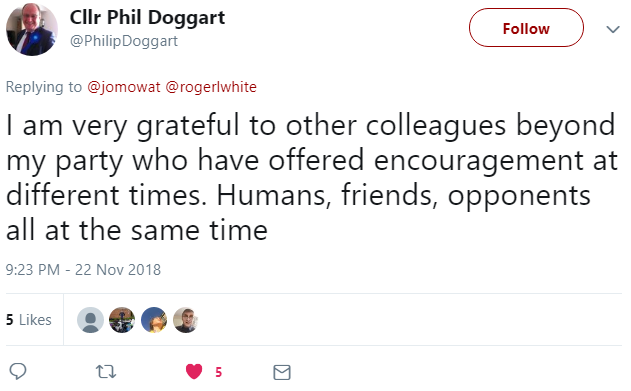 In either case, it’s amazing how many people – yet again (see examples above) – go out of their way to confide their confidential vote at the ballot box to a Yesser. Or maybe it’s just another one to file under ‘Fiction’ (and ‘Dodgy Arithmetic’). Stonehaven, of course, is packed with holidaymakers from the Borders in mid-December. They actually go there for the Greggs, you know. And what a coincidence – bumping into Mr McSwan (a.k.a. Purdie, late of Aberdeen Sheriff Court where he was found guilty of threatening and abusive behaviour against an MP’s staff) with ‘me National’ clutched on prominent display. Always a good conversation opener. 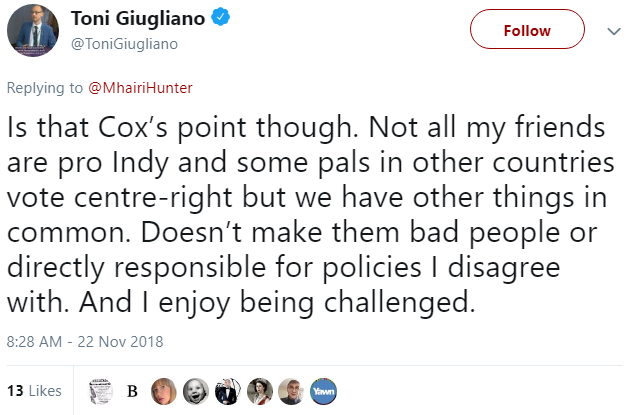 Meantime, his Twitter correspondent (also from the Borders) demonstrates one defining characteristic of the tradesman from hell – they will insist on discussing politics with their customers, in fact in this case with nine of them, who’ve all converted from No to Yes. The magic of electricity. This is becoming more amazing by the day. At this rate 110% of the Scottish population will be Yessers within a few months. 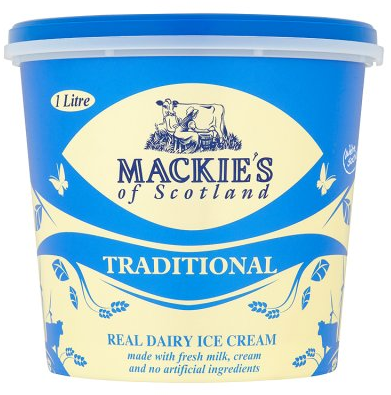 If you’ve not tried Mackies excellent dairy ice cream I’d urge you to. I especially recommend their white chocolate and coconut variety. 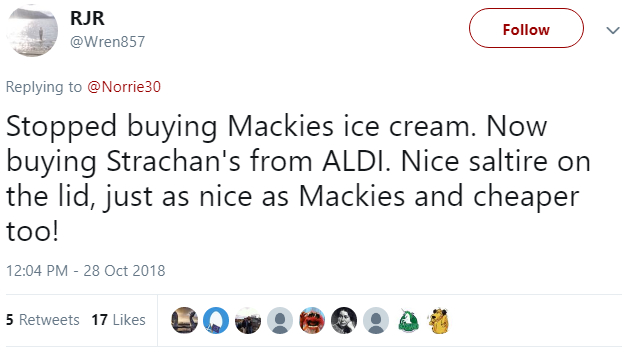 If the two products appear similar it may be because ‘Strachan’s’, an Aldi own-brand, is manufactured for them by, you’ve probably guessed, Mackies (my thanks to @dhothersall for pointing this out on Twitter). Ironies abound in what is only one case study amongst many. the request of our overseas retailer customers … [It] made the bars instantly recognisable as an imported product to the USA’ (cited in the link above). 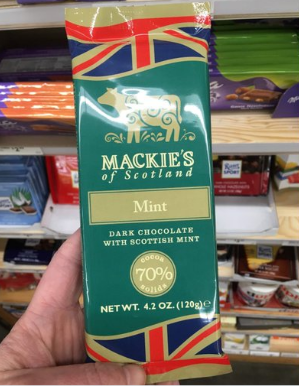 Far from hiding under the union flag, Mackies badge all their output, including both ice cream and errant chocolate bar, as the product of ‘Mackies of Scotland’. 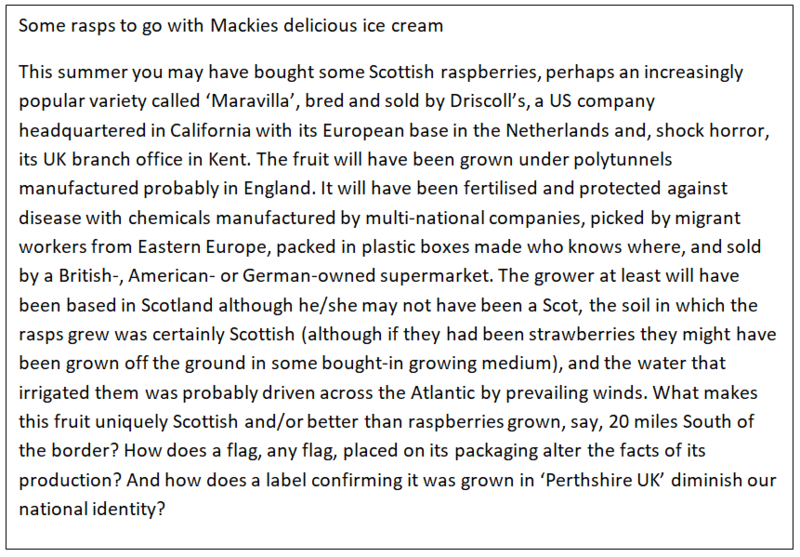 Despite the intent to damage the company through a boycott of their products, the ignorant action of recommending an alternative brand would only have resulted in Mackies ice cream being bought under another label, and incidentally benefiting a German-owned supermarket. There are at least three uncomfortable truths for Scottish nationalists in this nonsense. First, not only is the union flag more recognised internationally than the saltire, it is regarded abroad as a positive marketing attribute. Second, they are mere amateurs in what makes a successful economy. They do not know better than the companies concerned what is best for their business. Third, through their irrational devotion to symbols they are willing to actually damage Scottish companies that provide jobs and help drive our economy. None of this will be news to followers of Scottish politics for the last few years. The same sort of belligerency was evident in the 2014 referendum campaign: Tunnocks (confectionary) and Walkers (shortbread) come to mind as two successful Scottish companies that have been targeted in the same way. inappropriate labelling (as defined by objectors) is a valid reason to boycott the producer or retailer concerned. Like many people, other things being equal I’d prefer to eat food produced as locally as possible. This means it’s fresher and uses fewer ‘food miles’ to get to me. And if it’s genuinely better than produce from elsewhere, I’d prefer to buy it over an alternative product. If I were an aficionado of single malts, I wouldn’t look further than Scotland to stock my drinks cupboard, however the bottles were labelled. As for the rest, it’s hokum. 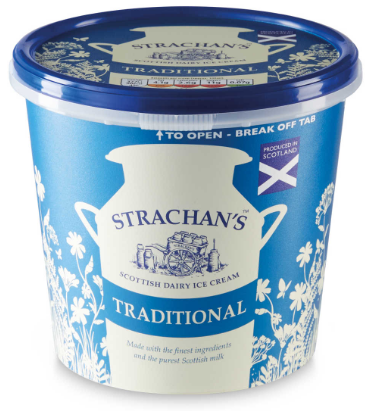 Anyhow, I think I’ve got my pudding tonight sorted – Mackies white chocolate and coconut ice cream with a side of Scottish rasps, Driscoll’s Maravilla as it happens, ‘Grown in Kincardineshire’. When we met on our recent trip you said it must be quiet up here because I hadn’t enlightened the world with my pearls of wisdom for two months. In the cause of family harmony, I didn’t respond at the time but thought I should explain now I’ve had time to think about it. In fact, there’s plenty to write about. I even started to collect some material on a few subjects but the truth is that when push came to shove I just couldn’t be ***ed because we seem to be locked in our own special time warp, as you’ll see when I get to the end of this missive. It saps the will, but I decided I should make the effort for you, so here goes. First, we’ve had three bizarre manifestations of the separatist tendency that lingers on here, manifestations that are oddly linked together. It started with a small group of die-hards who announced they were going to walk 500 miles ‘for indy’. You get the reference presumably? It was an old song by The Proclaimers, ‘I would walk 500 miles’, although if I remember correctly they were aiming to fall down at some girl’s door, not knacker their feet for a lost political cause. Mind you one of them, I can never remember which, has gone all political since then and pops up occasionally in The Natonal comic with his thoughts on some abstruse issue or other. Anyhow, the half-dozen or so 500 miles walkers were set off on their epic journey by Ian Blackford, the SNP Commons leader, who may or may not have known what he was doing. The leading lights in the endeavour seem to have been a rather odd hotelier and a guy who was proud to say he’d been a (strictly legal highs) drug dealer. The back up convoy for their effort included a car that, thanks to an online DVLA service, anyone interested could have found out was neither taxed nor insured. Some of the not-so-hardy band were clearly strangers to the art of long-distance walking and either gave up completely or emerged from the untaxed car only to hurple into the next town on their route to greet the handful of ‘Yes’ fanatics that could be bothered to turn out and view the spectacle. The highlight of their stupidity was a pit stop at Stirling Castle where they were asked politely by an employee of Historic Environment Scotland to move on as they clearly constituted a political demonstration on HES property. As you’ll guess, within a few hours the hapless employee was being dubbed a fascist on social media and the HES chief executive a yoon planted on Scottish soil by Westmonster. Or some such. The Stirling incident was an eerie forwarning of what was to happen at an ‘All Under One Banner’ event in Edinburgh as the walkers finally ended their dreary trudge. They were filmed on the day of the AUOB demo setting off from the car park of a suburban Edinburgh steak house with the aim of triumphantly leading the AUOB crowd through the capital’s streets to a rally in Holyrood Park. Maybe they did, maybe they didn’t. But they certainly didn’t feature in the self-publicity AUOB generated. The eerie forewarning I mentioned was the fact that AUOB also had a run-in with Historic Environment Scotland – about their planned rally in the park. They were clearly told that aspects of it were not on but seem to have gone ahead anyhow. Again, the spat was accompanied by the demonisation of HES as a tool of everything and everyone out to thwart Scotland, this regardless of the fact that it is a Scottish Government agency. Not that I noticed any SNP politicians saying that HES’s rules should be respected. Indeed, the AUOB march, at least at some stage, was headed up by Keith I’ve-not-really-been-moved-sideways-to-the-post-of-depute-leader Brown. And three lesser luminaries from the party chose to address the rally in the park. I wonder sometimes if these people know the tiger they’re riding. But then it has emerged that ‘All Under One Banner’ may not be the tiger it probably thought it was. Their banner seems to be big enough to encompass extremists of one sort or another, four separate registered companies seem to be or have been involved in it, its organisation and structure is unclear, some of its spokespeople have been caught writing unpalatable messages on social media, the collections taken at their events may not all be accounted for, and at least in its present guise it may be imploding. From afar, you may ask why all this matters? Well, they’ve held a series of events across Scotland this year and made unsustainable claims about each. In Edinburgh, they claimed that 40,000-60,000 or 100,000 or 193,000 (!) people marched for indy. A unionist group that held a counter-demonstration estimated, on the basis of a detailed count, that no more than 13,000 were present. Edinburgh council, working closely with the police, estimated 20,000. I’ll stick with the council estimate. As with so much of nationalism, there’s a constant need to ‘big up’ the claimed support. All part of the black arts of propaganda, I guess. The third linked manifestation to touch on is a recent ‘blockchain’ poll purporting to show that over 98% of the population supports independence. The legal-high drug dealer seems to have been involved with this nonsense too, scurrying around to sort out some problem with addressing that meant not all the intended target of Scottish residents could vote. As only 1,600 did anyhow the whole exercise meant diddly-squat although it got too much publicity. And no I haven’t got a clue what blockchain democracy is. Meantime, at the serious end of the nationalist spectrum, the SNP held their autumn conference. There were the usual glib generalisations about independence, its inevitability but just not quite yet you understand, and all the rest of it. Curiously, the one thing that should have given the party pause for thought this year – their Sustainable Growth Commission’s report – seems to have got scarcely a mention despite the fact it was only last month depute leader Brown led three member ‘national assemblies’ (they go in for pompous titles) that gave them reams of feedback on Post-it notes. All disappeared without a trace. Well, that’s about it I guess until our next session. Apart from one thing – the latest poll by Survation for the Daily Record suggests 45% of the population support independence and 55% oppose it. Usual caveats about trends etc but does that sound familiar? It should. It was the referendum result in 2014. Four years of energy expended on a lost cause with the basics of good government neglected, and no change in public opinion. What a waste.